Indie Game Development - "Having fun, making fun"
Looking for something new to play with your friends on the Xbox 360? Wizard Rage goes Live on Xbox 360! 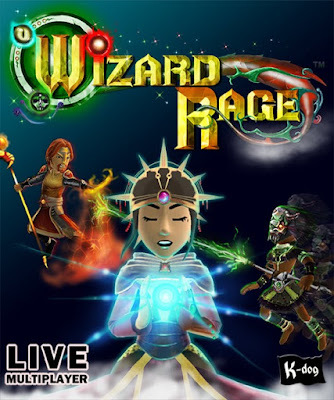 I am pleased to announce that my newest game, Wizard Rage is now live on the Xbox 360! 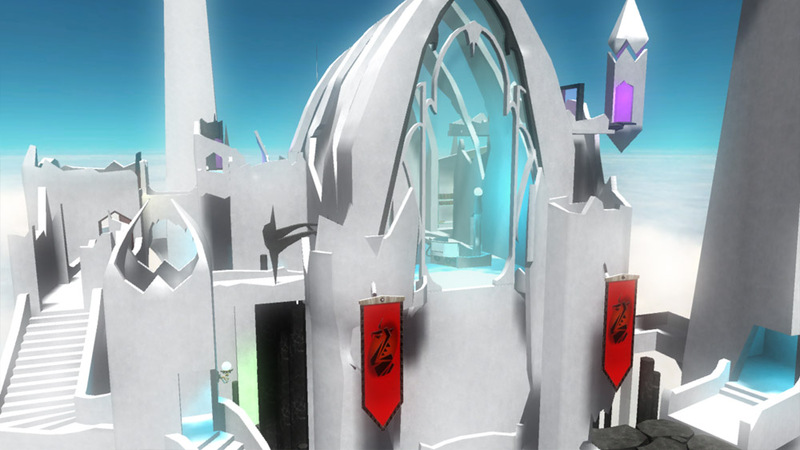 Wizard Rage is an awesome new FPS for gamers looking for new content on their Xbox 360. It takes traditional FPS gaming in a bold new direction - and its a LOT of fun. Check it out! 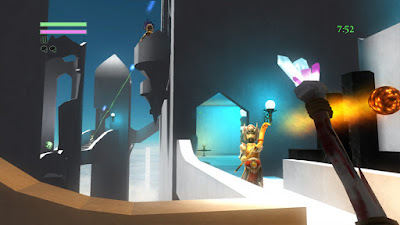 A skybox is a series of images of the sky and mountains that player's can see in the distance. The temp skybox art we were using did not match the theme of the game, so I spent some time searching online for a website that licensed skybox art. To my surprise there were none. I then began researching how I could create one myself. I found a software package named Vue and after a few tutorials was able to create a new skybox. Our castle now rises up out of the clouds. Next I experimented with creating terrain using a height map. This terrain would extend from our castle toward the skybox, creating a middle ground visually connecting the two. This did not prove to be difficult and is actually pretty cool, but I could not pull off the look that we are going for, which is a series of columns rising up out of the fog. It turns out we can achieve the effect we are looking for by simply modelling the columns we need. In fact, we can do it with even less polys than the procedural terrain which is good for performance. Instancing is a method of drawing multiple copies of the same model at a fraction of the cost in performance. It is great for drawing trees and other objects that you can position procedurally and even animate. I looked into using it for portions of our environment or for light fixtures. However, it turned out not to be well suited for the limited number of static objects I was going to use it for. Mip Maps are a way of reducing the texture size used on models that are drawn at a distance. It can improve both the look and performance of a game. Luckily, the Sunburn engine I'm using can automatically generate and manage mip maps. I also tested the environment with a special texture provided by the Sunburn community that displays the recommended resolution of textures based on distance. Our current max texture size is 1024, which looks pretty good but does become blurred at very close range. If we have enough memory, I may increase texture resolution so they hold up even at close range. 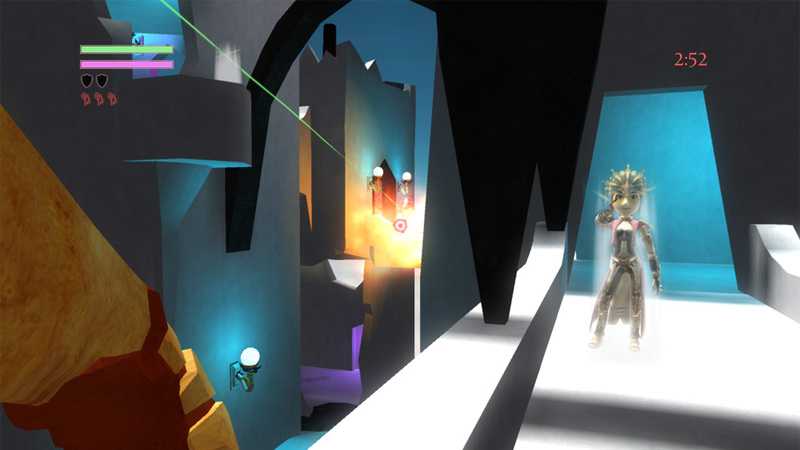 The Sunburn engine supports both normal maps and emissive maps. An artist had explained normal maps to me in the past, so I had a vague idea about how they worked. I took the time to research how normal maps are made, and this is going to enable us to create much better looking props while keeping the poly count low. While doing some tests, I discovered that all the character's weapons add up to almost as many polys as our environment itself. Ouch! I talked to a producer friend of mine about plans to switch to different level of detail models for enemy weapons, and he suggested simply using a lower detail model for enemy weapons all the time. We will try that out, and if it doesn't look good we can always switch between different detail levels later. 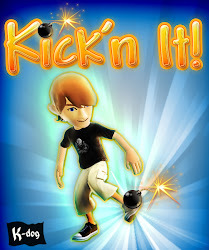 We will be featuring avatar's on our box art as we did for Kick'n It and Ultimate Dodgeball. Since we have three different character classes, I would like to show each class on the box cover. So I searched through all the costumes available for avatars and chose a costume that best exemplified each class. I then put weapons into their hands and animated the characters into different poses. The screenshots I took of the characters can now be used to create the box cover. I love sound effects in games. Without sound and music, games or movies simply don't hold my attention. I like to start with great music that really captures the action and character of the game. Both Ultimate Dodgeball and Kick'n It had great music. This was a bit of a dilemma for me this time as First Person Shooters rarely have in-game music. I compromised by having a powerful, inspiring soundtrack at the menu when the game loads and the player gets his first glimpse of the level. Then in-game, I switch to different ambient tracks that play based one what part of the environment the player is in. One of these is a mysterious, melancholy tune that I absolutely love, and that I hope players feel works well within the shooter. I have probably twice as many sound effects in this game as I did with Ultimate Dodgeball. As has been my policy for years, every action or reaction in a game gets its own sound effect. Since I have three character classes and multiple powers, that adds up to a lot of sound effects. But the number of sounds didn't turn out to be a problem. Tracking down real-world sounds like the sound of a dodgeball hitting a wall or the screech of a sneaker on the gym floor is often more challenging than fantasy sound effects such as summoning a fire wall, which can be created from all sorts of different sound clips. The real challenge with doing sound in an FPS is that it is 3d sound. Last month I completed all the special effects in the game. Although I used both 2d and 3d particle effects in Ultimate Dodgeball and Kick'n It using the effects system provided by Microsoft in the XNA code samples, I quickly realized I would need something more. 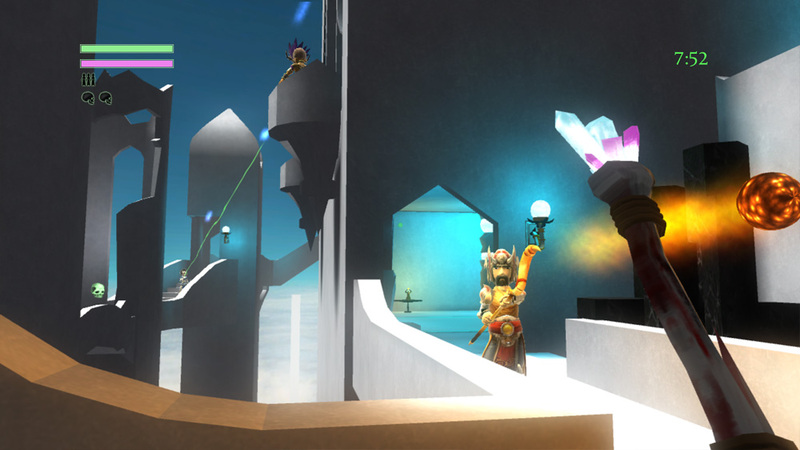 With three character classes and upgradable powers there are simply a LOT of special effects in the game. Rendering that many particles would simple slow the game down to a crawl. In addition, there were types of effects I wanted to do that the Microsoft samples were not designed to handle. Luckily I discovered DPSF particle system. While this particle system doesn't run on the GPU like the Microsoft system, it enabled me to control the orientation of a particle instead of always having it face the camera. Therefore, I could make lightning, shimmers, walls of flame and portals. Best of all, it supports animated particles. Now, instead of rendered hundreds or thousands of particles for a single effect, I could use another great tool - the TimelineFX Editor to create an awesome particle effect and export it as a sprite sheet. I could then display that animation in-game on a single animated particle, saving performance. Discovering these resources and methods not only enabled me to complete a much larger number of particle effects, but to step up the quality at the same time. I'm excited to see what people think when I enter focus testing. 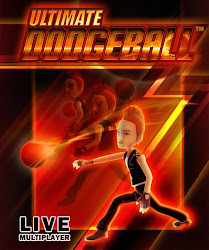 Ultimate Dodgeball on the Xbox 360 Dashboard! I just received another early Christmas gift from Microsoft this week. 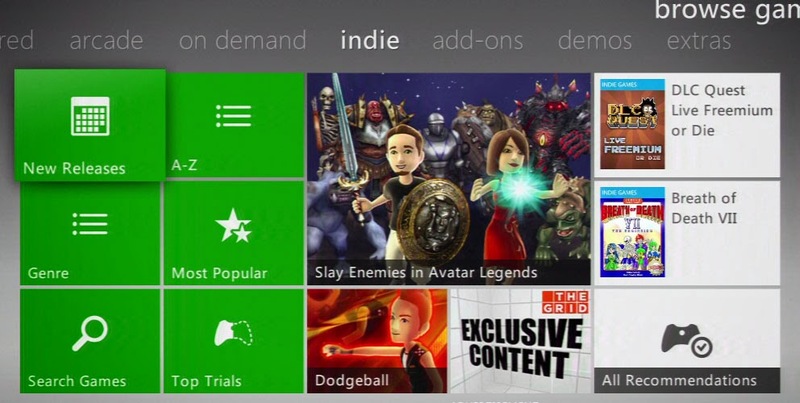 Ultimate Dodgeball is being featured on the Xbox 360 Dashboard! Last year Microsoft featured it on their big promo spot and it shot up to 2nd place on the best selling chart. This year it received the smaller promo spot, so it will be interesting to see where it ends up on the sales chart. So far, it has risen from around #30 to #7, but I think it will keep going. A big thanks to Microsoft for the exposure! Last summer I met with our school district's superintendent and shared the video I made for him, and expressed my passion for providing programming opportunities for every elementary student. He was very receptive, and I agreed to do further research on resources that would extend programming instruction into junior high, as well as for app creation. I presented my recommendations in a follow-up meeting with his team, and he asked if I would create a series of workshops to train teachers how to teach programming with Hopscotch and Scratch, in addition to a seminar to introduce principals to the Hour of Code. In just a couple weeks I will be introducing the Hour of Code to principals in our district. I'm very excited, and hopeful that they will adopt the Hour of Code at their schools. Last year I taught 130 kids how to make their own programs, but this year thousands of students in our district can discover computer programming. 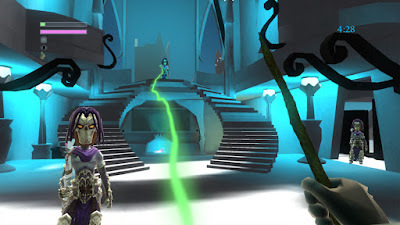 K-dog is the indie studio of game designer Brent Kollmansberger. Brent has been working in the game industry since 1997. His shipped titles include Wizard Rage, Ultimate Dodgeball, Kick It, Transformers Revenge of the Fallen, 007 Quantum of Solace, Spiderman 3, Spiderman 2, and Klingon Academy. In addition he designed and launched over 20 web games as Games Director for FoxKids.com. Wizard Rage is the third game released by K-dog.